If asked, many people would reply that the purpose of a Corporation is to produce a profit. This is a misunderstanding of the purpose of corporations. Corporations exist to gather together the people and resources necessary to provide a product or service. Profit has a role to play in this enterprise. It is the means by which the capital necessary to establish and maintain the corporation can be acquired. Profit is the incentive and motivation for investment, It is not the objective of a corporation. When profit becomes the purpose of a corporation, the tail is wagging the dog. Apple, Amazon, and Tesla are samples of corporations that understand their true purpose. Profit Is a consequence of producing an outstanding product or service. Corporations that understand their true purpose have a vision and take the long view. Corporations that work towards next quarter profits are taking the short view and their lackluster products or services are a consequence of their view. Why are used electric car prices so low? Three factors affect resale value on electric cars. First isthe federal tax credit and in some states a state tax credit and other incentives. Also electric car prices have fallen since introduction in 2011. And finally electric cars are improving functionally as new models are introduced. The upside is for those who can’t afford a new car or don’t qualify for tax credits, used electric cars are very affordable. You can buy a low mileage used LEAF for less than $9,000. If you calculate used electric car prices based on MSRP, depreciation may seem high. But you must remember most new car buyers and dealers leasing these cars got a the federal tax credit of $7,500 and sometimes addition state tax credits. California has had a $2,500 and Georgia a $5,000 incentive for example. While such incentives are in place, used car prices will be correspondingly depressed ed. Used car prices may increase as such incentives are discontinued. In addition new electric car prices have dropped by $6,000 or more. This puts additional downward pressure on used car prices. And finally there are functional improvements to range and charge time along with other features like more trunk space in the LEAF among many minor improvements like lighted charge port in the LEAF. All the factors combine to make it more attractive to buy a new electric car compared to a used one priced at traditional depreciation rates. If you want to sell your used electric car you need to lower the price to account for the fact that newer models are cheaper than what you paid and have better function and more features. On the other hand if you are buying there is good value in used electric car. You’ll love your used electric car. Here’s why. Things you’ll never say to a mechanic about that four year old electric car you just purchased. • She won’t turn over. • She turns over but she won’t start. • The clutch is slipping. • When the transmission shifts it makes a loud clunking sound. • Can you turn down the idle? • I SAID, I HAVE A NOISEY MUFFLER. • She won’t shift into third. • She’s only getting 10 miles per gallon. • I hear this knocking when I’m climbing hills. • Do I have to use high test? • The alternator light won’t go off. • My tail pipe is dragging on the ground. • She hesitates when I press hard on the gas. • I need an oil change. • How much will it cost to replace my leaking valve cover gaskets? 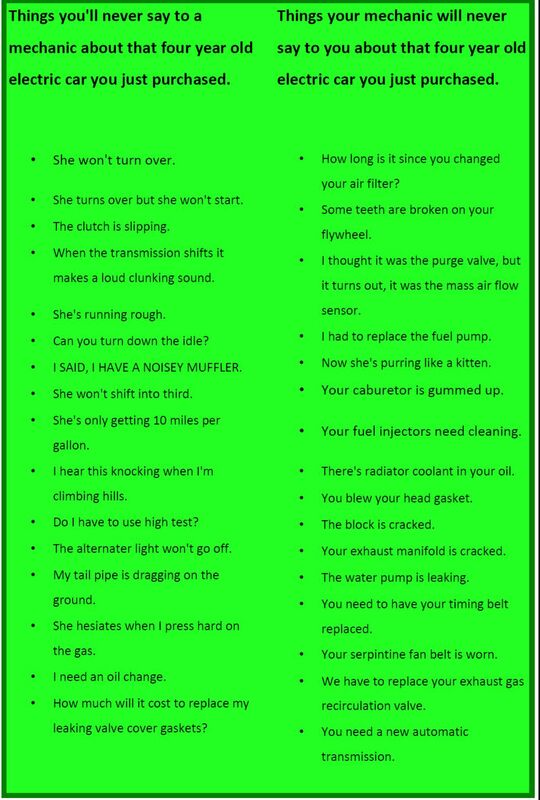 Things your mechanic will never say to you about that four year old electric car you just purchased. • How long is it since you changed your air filter? • Some teeth are broken on your flywheel. • I thought it was the purge valve, but it turns out, it was the mass air flow sensor. • I had to replace the fuel pump. • Now she’s purring like a kitten. • Your carburetor is gummed up. • Your fuel injectors need cleaning. • There’s radiator coolant in your oil. • You blew your head gasket. • The block is cracked. • Your exhaust manifold is cracked. • The water pump is leaking. • You need to have your timing belt replaced. • Your serpintine fan belt is worn. • We have to replace your exhaust gas recirculation valve. One of the benefits of being a member of the Electric Auto Association is that each month we receive “Current Events”, our monthly electric car news magazine. 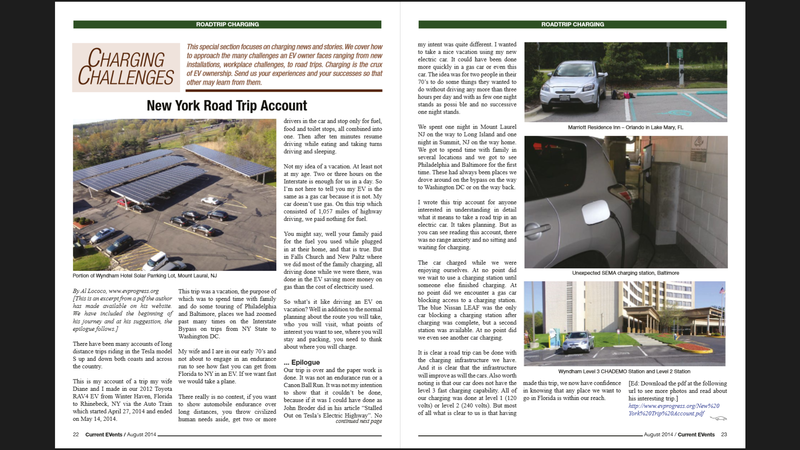 Here is a link to the August issue which has at the centerfold an article about the 1,057 mile East Coast trip my wife and I made in May in our RAV4-EV. Here is a link to the trip account. 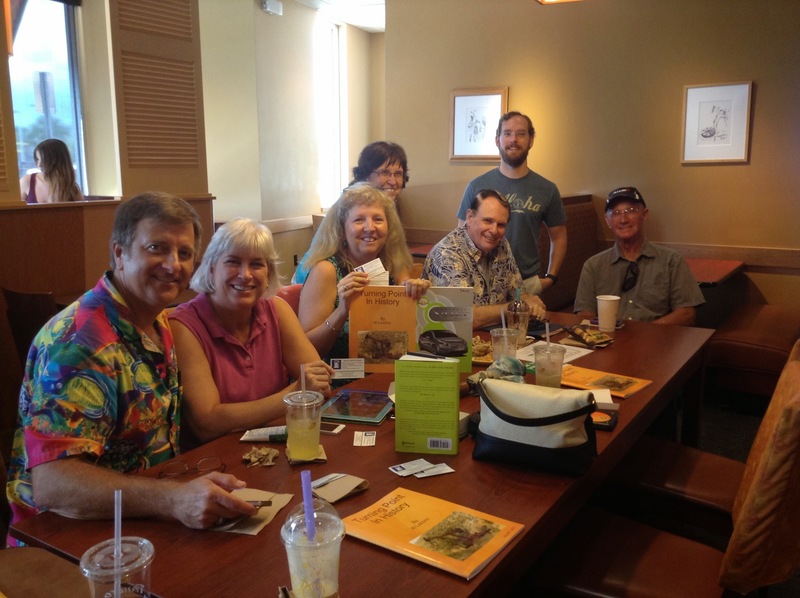 Each month the Space Coast Electric Vehicle drivers host an informal Electric Vehicle drivers meet up at Brevard County area establishments located within walking distance of a public charging station. These events usually take place the first Sunday of each month, with the exception of months with holidays falling on or close to the date (such as July 4th). For those who couldn’t make it we post an event recap for each month to keep you all up to date! 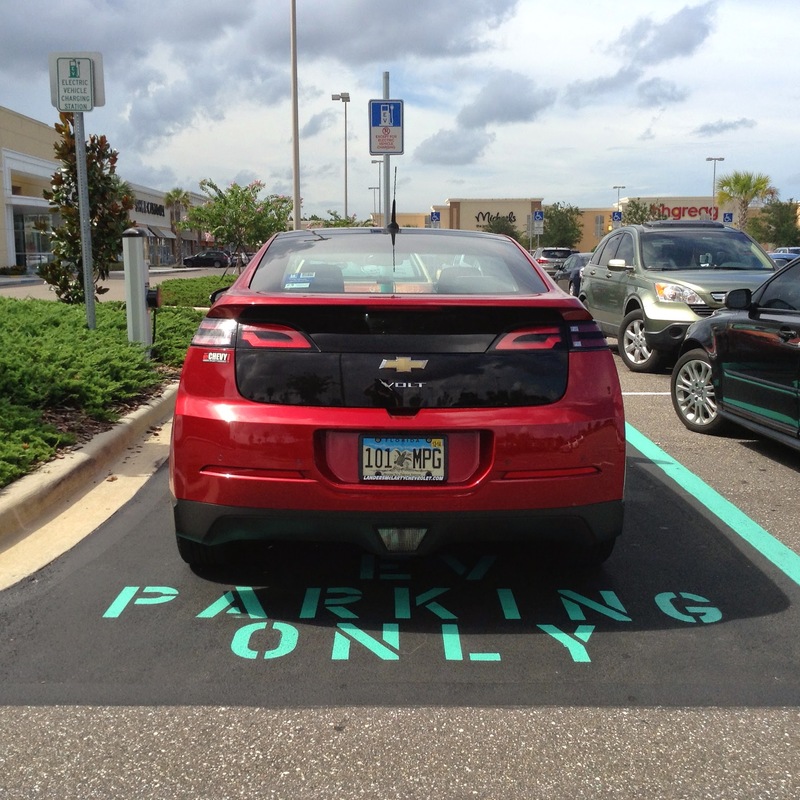 This past Sunday we held our July EV Event at the Panera Bread in Palm Bay, FL’s Hammock Landing shopping area. 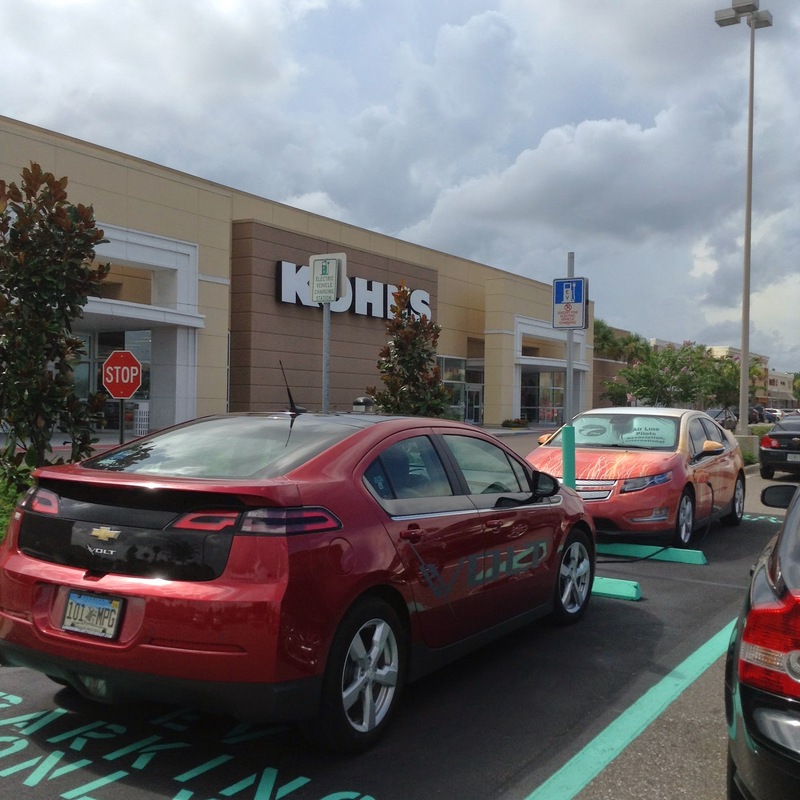 The Kohl’s, which is walking distance to Panera has two designated EV parking spaces with a single J1772 Level 2 charger and a 110V outlet. Unfortunately the charger was giving some of our members a hard time and it took quite a while to switch it from one car to another. Luckily one of our members who frequents this charger gave it a little tough love and solved the problem. We welcomed one new local member with a Chevy Volt and had the pleasure of meeting Al Lococo and his wife, of the Central Florida and Sun Coast EAA who drove their Toyota RAV 4 EV all the way from Winter Haven, FL to attend July’s EV event. 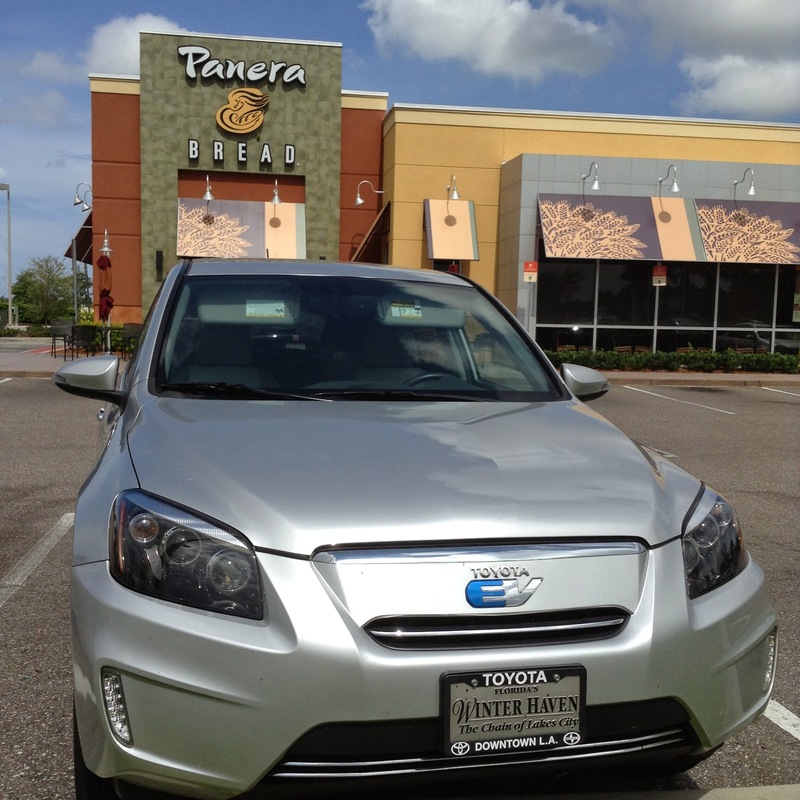 A Toyota RAV 4 EV from Winter Haven, FL attends the July SCEV Drivers meet up. If you are counting rare EVs in central Florida this is the second 2nd generation RAV 4 EV to attend a Space Coast Electric Vehicle Drivers meet up. Pretty impressive when you consider they were never sold in the state of Florida, Toyota has only sold 1,594 of the 2,600 2nd generation RAV4 EVs produced and Toyota has announced they will not be producing any more of these SUVs in favor of other technologies. Overall it was a great meet up and we are looking forward to next month! The next meet up will take place on Sunday August 3rd from 2-4 PM in Downtown Melbourne. We will be parking at the L3 charger at City Hall and then walking over to a local restaurant TBD. 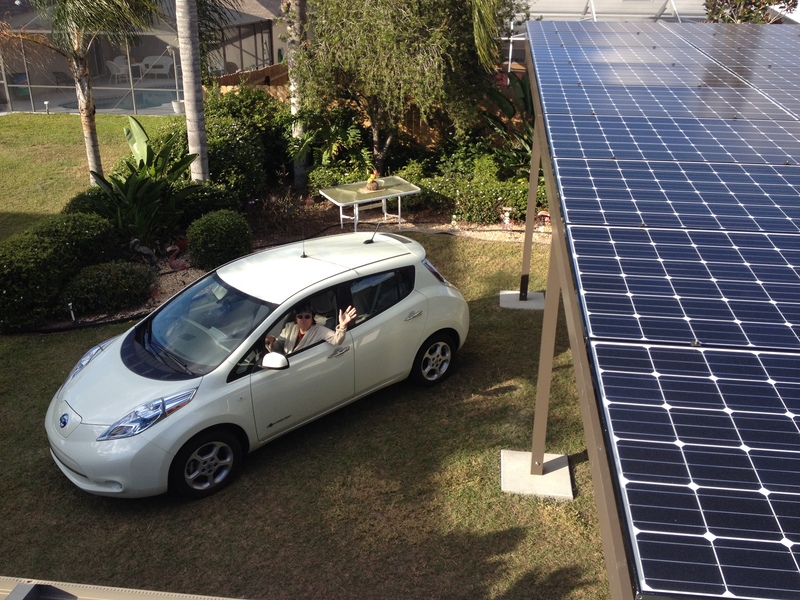 We look forward to seeing you there and thanks for supporting the Space Coast EV Drivers!